Buy this item and earn 235 ClubPoints. Convert any Hi-Def source to standard definition NTSC/PAL format with scaling. 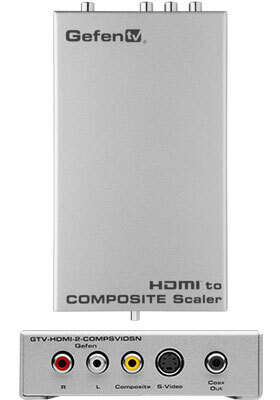 This HDMI to analog video scaler supports resolutions up to 1080p Full HD video and scaled outputs in Composite and S Video, while maintaining the original aspect ratio for optimal viewing. The coax S/PDIF digital audio and left/right analog audio outputs allow the audio extracted from the HDMI signal to be sent to any AV receiver or audio amplifier. Underscan/overscan and NTSC/PAL switches help assure compatibility with a variety of analog televisions. This scaler also features a USB port for firmware upgrades. 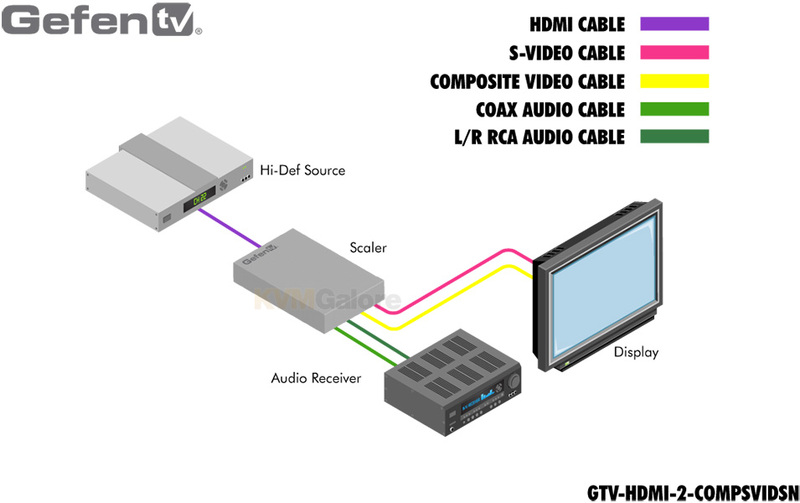 Using the included HDMI cable, connect the Hi-Def source to the HDMI input. Use a composite or S-video cable to connect the scaler to the analog monitor. Connect the scaler to an A/V Receiver or amplifier using an S/PDIF cable or an analog audio stereo patch cord with RCA connectors. Connect the power supply to the scaler and to an available electrical outlet. Power on all connected components. Use the NTSC/PAL switch on the scaler to select the correct output format for your TV. Select Underscan or Overscan using the slide switch on the scaler to compensate for scanning characteristics of your analog TV that could result in over-cropping of the image or visible black borders. Note: This device is not HDCP compliant.